Claudius Monet (natus Lutetiae die 14 Novembris 1840; Giverny in oppido mortuus die 6 Decembris 1926) fuit pictor Francicus. Amicus erat pictoris Gustavi Courbet, scriptoris Octavii Mirbeau, sculptoris Augusti Rodin. Le déjeuner: panneau décoratif, c. 1873 (Museum Orsay). Herbert, Robert L. 1995. Monet on the Normandy Coast: tourism and painting, 1867-1886. Novo Portu: Yale University Press. ISBN 0-300-05973-6. Howard, Michael. 2007. The Treasures of Monet. Lutetiae: Musée Marmottan Monet. Tucker, Paul Hayes. 1995. 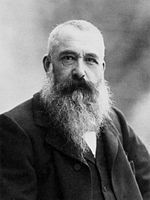 Monet: life and art. Novo Portu: Yale University Press. ISBN 0-300-06298-2. Vicimedia Communia plura habent quae ad Claudium Monet spectant. Novissima mutatio die 20 Septembris 2018 hora 14:49 facta.